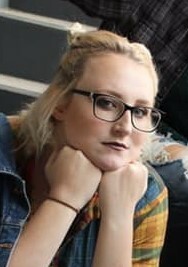 Jordan Lynae Asher, 21, Kokomo, passed away at 10:45 pm Monday, April 8, 2019, as a result of a car accident. She was born November 18, 1997, the daughter of Jerry L. & Robin R. (Johnson) Asher. Jordan had a lifelong love of all things Disney. She was blessed to spend a semester in the Disney College Program. She also loved music, reading, painting and animals…specifically her cat, Lady. Along with her parents, Jerry & Robin, Jordan is survived by her sister, Katie Asher; grandparents, Bill & Brenda Johnson; step-grandmother, Linda Asher; aunts and uncles, Jay Asher, Joe (Gloria) Asher, Jim (Angie) Asher, Karyn (David) Buehler, Donita Johnson, Shelly St. Clair, and Deb (Will) Short. Funeral services will be held at 11:00 am Monday at First Baptist Church-Galveston, 207 Sycamore Street, Galveston, with Sean Cooper, John Murdoch, and Mark Davis officiating. Burial will follow in Galveston Cemetery. Friends are invited to visit with the family from 2-8 pm Sunday at the church. In lieu of flowers, memorial contributions may be made in Jordan’s memory to the Howard County Sheriff’s Benevolent Fund, 1800 W. Markland Ave., Kokomo, IN 46901, or to the Crohn’s and Colitis Foundation, National Headquarters, ATTN: Financial Operations, 733 Third Avenue, Ste. 10, New York, NY 10017. Stout Funeral Homes has been entrusted with arrangements. Messages of condolence may be left online at www.stoutandson.com.